Moving ahead together - with GEORGI! As one of the leading companies in the Road Feeder Service in Europe, at GEORGI Transporte we handle the logistical challenges of our customers. Due to the fact that the logistics industry is always on the go, we only deploy latest technology and well trained staff to meet the various requirements of our customers. 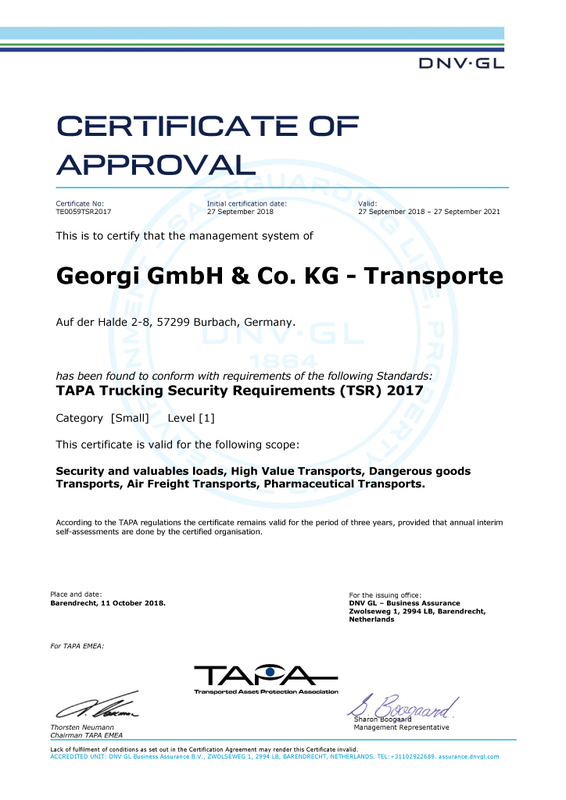 Apart from our core Road Feeder Service business, we have also specialized since 2000 on handling highly sensitive shipments in the security, high-value pharmaceutical and hazardous cargo sectors. Specialized engine transports, outsize shipments as well as road convoys and escorts are part of our services. We strive to ensure that we will always find a way to make the impossible possible by always selecting the best solution for our clients and by also reacting swiftly to their wishes and requirements. As a grown family business GEORGI Transporte preserved its family character. 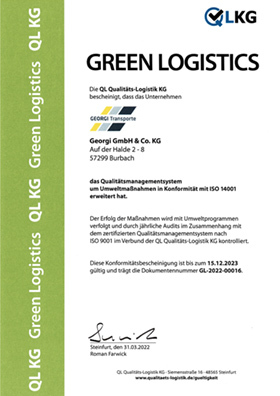 Since 1994, the company has been successfully managed by Jürgen Georgi, the son of the founder of the company, Siegfried Georgi. With 700 employees within the GEORGI Group and a state-of-the-art fleet of over four hundred vehicles as well as our own fleet in Mörfelden (Frankfurt am Main) we operate throughout Europe. Customer-oriented workflow is our first and foremost principle. Offering expertise and custom services tailored to our clients, we build trusted relationships. This is the strength of our company: Building long-time relationships and a safety net our clients can rely on. Because only satisfied and trusted customers ensure long term economic success and job security. Optimization of proccesses and constant improvement of our services are one of our greatest endeavors. We thouroughly deal with the goals of our customers and offer them differentiated, tailor-made services that align with their special needs. Motivating our employees employees is a basic requirement for trusted and efficient collaboration within our company. Our staff can do more than their imposed tasks. Every one of our team members knows that they shape and represent our company. Enjoyment in their work is what enables our staff to continously come up with solutions to all kinds of problems that arise in the daily business of transport. Teamwork is the driving force for realizing our goals. Only through working together effectively we can adapt to shifts of the market and continue to position ourselves competitively. No matter whether LTL and FTL transports - the GEORGI Group consists of four companies, which cover everything to do with the Road Feeder Service business. We are experts in our specific sectors. We thus provide the perfect solution for every shipment whilst utilising the synergies of our group of companies. "I stand for a strong and sustainable partnership." One of our main objectives is to cause the least possible stress for the environment. 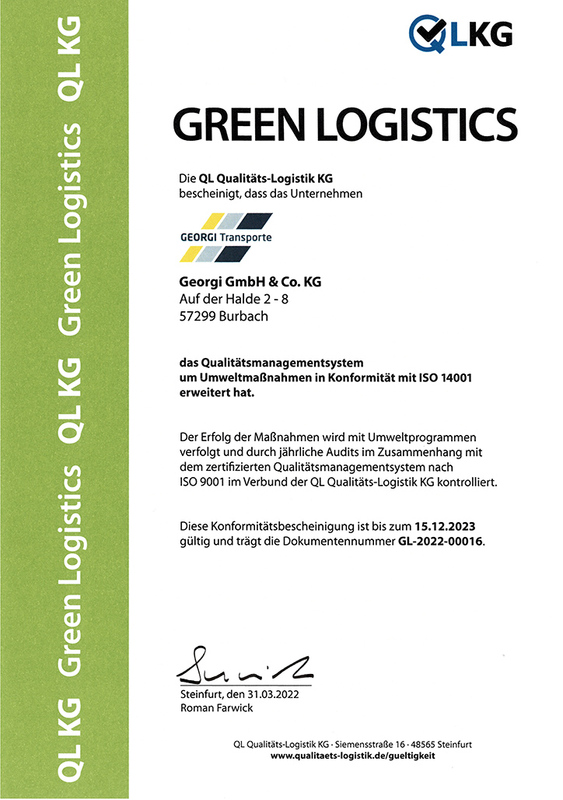 We consistently strive to reduce the level of CO2 emissions and our fuel consumption. 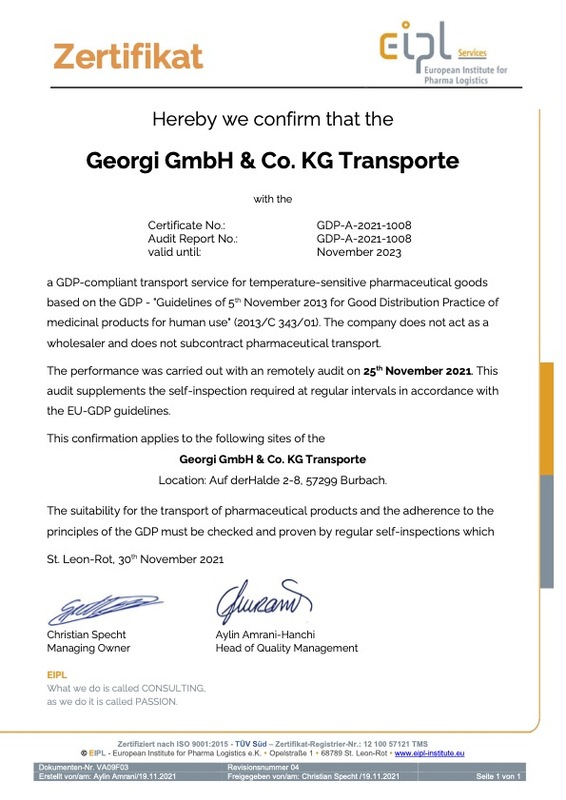 For this reason, GEORGI Transporte relies on a state-of-the-art fleet of Trucks that comply with the EURO 6 exhaust emission standard. 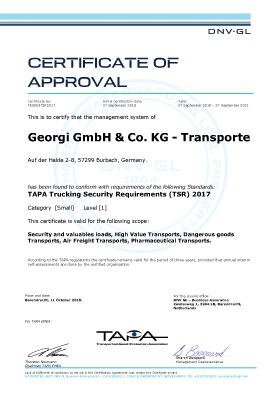 Our own truck fleet with workshop and TÜV acceptance ensures that our vehicles comply with this high standard. In addition, we regularly train our drivers so as to promote economic and fuel-saving driving methods. In this, we are additionally supported by a state-of-the-art Telematic System. So as to constantly improve our climate balance, we promote environmentally friendly technologies and strive toward continuous improvements for the benefit of our clients as well as for the environment. Investment in a long-distance road train. Implementation of a fixed transport schedule in Switzerland for German Federal Railway. Use of an additional long-distance road train. Implementation of national and international transports. Investment in the first special vehicle. Implementation of Road Feeder Services in a subcontractor association. Initial own transport operations on behalf of reputable airfreight companies. Handling of international Road Feeder Services. Fixed line transport operations to England, France, Switzerland and Denmark. Purchasing additional special vehicles for handling aircraft engine shipments. Specializing the fleet of vehicles and the staff for handling all kinds of special and exceptional shipments. Investment in state-of-the-art IT and Telematic systems. Procuring the license for transporting radioactive substances and delivery of explosives. Extending the fleet of vehicles to two hundred Trucks. Convent GmbH Air Cargo Transporte becomes part of the GEORGI Group. Certified as a regulated agent by the LBA. 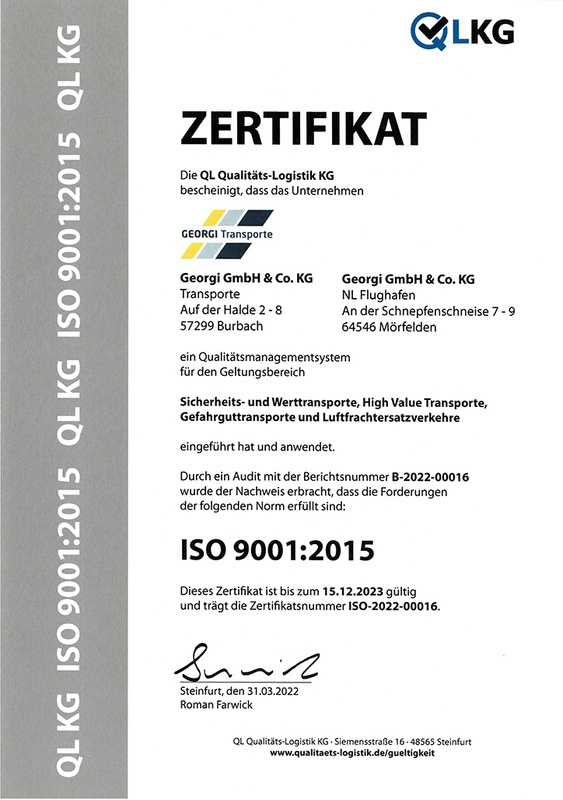 Weigl Air Cargo Service (WACS) and its subsidiary ACSL/CZ becomes part of the GEORGI Group. Procurement of twenty additional TAPA TSR 1 and pharma-certified (GDP) airfreight refrigerated trailers. GEORGI Transporte Sp. z o.o. Sp. k. in Wroclaw becomes part of the GEORGI Group.